Carmelo Anthony is one of the elite players in the NBA, a top contender for league Most Valuable Player and one of the NBA’s highest paid players at almost $20 million annually. J.R. Smith is one of the league’s top athletes, a sometimes erratic personality who is considered a strong candidate to be the league’s top sixth man. 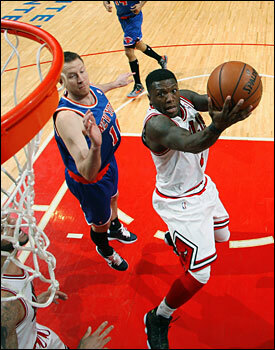 Nate Robinson had his non-guaranteed minimum contract finally picked up by the Bulls in January. Jimmy Butler was the last first round pick in the 2011 draft who played about 350 minutes all last season and three minutes in the playoffs. But Thursday in the United Center on national TNT it was the little and little known guys outshooting and outplaying the big city guys as the Bulls ended the Knicks’ 13-game winning streak behind 35 points from Robinson and 22 points and a career best 14 rebounds from Butler in a 118-111 overtime win. It gave the Bulls a 4-0 season sweep of the Knicks and solidified the Bulls’ fifth seed in the Eastern Conference as they moved to 43-35. “Super fun game,” said the always upbeat Butler, who also helped push Anthony into 13 of 34 shooting as Luol Deng was back from his hip injury but in foul trouble. “We dig ourselves a hole (down 23-6 midway through the first quarter). But it was fun competing against players of such high quality who can do so much on the offensive end. In addition to his impressive points and rebounds and defensive effort against Anthony, who still had 36 points with Smith at 28, Butler had three blocks and three steals, two of which turned the game around after the Bulls trailed 77-62 with 5:20 left in the third quarter. The Bulls had recovered from yet another miserable start working in the returning players with Deng joining Richard Hamilton and Marco Belinelli back. Hamilton, especially, looked better with 14 points and a team high eight assists, and coach Tom Thibodeau was oh so relieved to get back his playing security blanket Deng. It was an unusual game with the Knicks missing Tyson Chandler and Kenyon Martin while for the Bulls Joakim Noah and Taj Gibson remained out. Gibson was trying on his new knee brace after the game he said he’ll wear when he returns in the next few games while Noah remains uncertain with his plantar fasciitis, though he had a spirited pregame workout and moved well. He should also play before the end of the regular season. 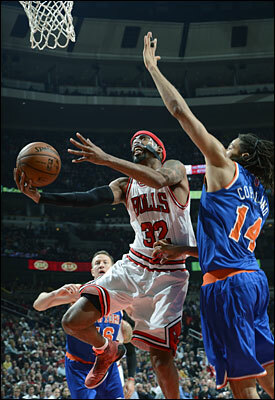 But with both teams’ top big men out, the Knicks started Chris Copeland at center while the Bulls went with Boozer. Though Boozer had 13 points and 15 rebounds for his tenth double/double in the last 12 games, he wasn’t that effective, especially early, in taking advantage of his size inside. 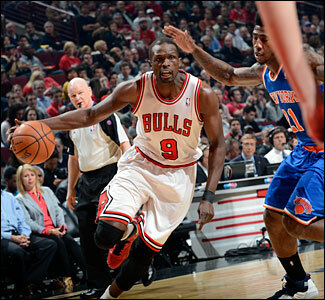 Eventually, Deng and Anthony became the centers in an all-perimeter game by both teams. It didn’t seem like a game for the Bulls with another of those casual starts. But behind Butler and Deng and forcing Anthony into tough shots the Bulls got within four before a Smith three to end the first quarter gave New York a 30-23 lead. ESPN had a revealing statistic about why the Knicks probably aren’t going far in the playoffs. Anthony took 34 shots with 53 total touches in the game and in the second half passed just five times with 27 touches. You’re not winning playoff games not only shooting all those threes, but constantly standing around watching Anthony shoot, as the Knicks do. Though Anthony got a good look at a regular game winner at the buzzer, which suggests it was hardly an easy Bulls win in the end, the Knicks’ offense is predictable with coach Mike Woodson relentlessly calling Anthony postups. Anthony is a powerful and effective scorer. But he takes most of his team out of the game too often. And he tends to lose composure, as he did once again with a technical foul complaining about Butler’s play against him in the second quarter. Smith also got one because he boils over as the pressure increases, and Robinson got one because he is Nate. “He’s constant entertainment,” joked Hinrich. The Knicks generally don’t like to be played tough. Earlier this season, Anthony, Chandler and Woodson were all ejected during a loss to the Bulls. “Every time we see Chicago, they try to beat us up,” said Anthony, echoing a complaint of LeBron James when the Bulls last week broke Miami’s 27-game winning streak. And the Bulls also would have broken Denver’s double digit winning streak if Noah’s winning follow had been allowed. As it was, the Bulls became the first team since Phoenix in 1991 to end two double digit winning streaks in the same season. We’re not sure what that means or why, and it’s not likely to be vital in the playoffs. Nevertheless, the Bulls have a good game plan to play the Knicks. The Bulls don’t leave the perimeter much to double, which the Knicks rely on to open their shooting game. The Bulls will stunt more and recover, though Hamilton did get a steal from Anthony once on a blind double off the baseline. But the Bulls play the top scorer physically, hit the boards, though in the smaller lineup Anthony had an impressive 19 rebounds, and chase players off the three point line or get in their face deep and take and give the hits. It was amusing once again to see Anthony late in the game complaining to Boozer about a hard hit, not unlike how James did taking a cheap shot flagrant late in Miami’s streak busting loss. Against the Nets, Boozer also threw down hard his former teammate, Deron Williams. Those muscles don’t only look good. Boozer has been using them to good advantage. That second quarter produced 14 total fouls and three technicals, including one on the generally quiescent Deng as the Knicks still led 59-54 at halftime. 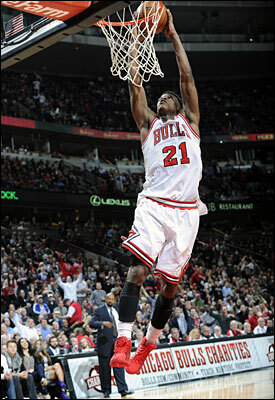 But the Bulls behind Robinson also were making shots this time. Robinson has become a polarizing figure on the team, unusually effective for a mostly unwanted free agent for his undisciplined shooting. But he’s also a rarity on the Bulls for his ability to create off the dribble, get shots whenever he wants—and when no one knows they are coming, joked Deng—and give a boost to an often stagnant offense. And with that his treasure trove of antics after made shots that thrill the crowd, which even was chanting “MVP” for Robinson. Now that he did make the team and guarantee his minimum salary, he should be eligible. It also was one for the Olympic towel throw that Thibodeau may enter after he got a qualifying entry early in the fourth quarter when Robinson tried a three quarter court lob pass to Hamilton that sailed out of bounds. Though it did come the possession after Hamilton penetrated and found Robinson in the right corner for a three that gave the Bulls an 88-84 lead. Robinson and Hamilton being best friends on the team you knew Nate was going to try something. Just that Hamilton doesn’t jump like he once did. Or at all. I know a lot of fans ask about picking up Allen Iverson. But that’s who Robinson is. Like Iverson, he was a former football player, a strong, tough little man in a big man’s game who has no idea he’s smaller than everyone else. No one on the team takes harder falls than Robinson and keeps getting back up and throwing himself harder into the game. Boozer may be stronger, but no one probably is tougher than Robinson. And off he was into the night to take a lot of pictures of himself he posts on social media and perhaps add to his wardrobe of hundreds of pairs of sneakers. The Bulls looked in trouble as their comeback seemed to fizzle when the Knicks began the second half strong with Anthony and Raymond Felton scoring, Copeland knocking in a three and Deng drawing his fourth foul, leaving Anthony to Butler for the rest of the game. The Knicks were celebrating when Pablo Prigioni beat Hamilton on a drive for a layup to make it 77-62 with 5:20 left in the third and Anthony added a jumper after Hamilton came back to score. But in the end the Bulls would match their biggest comeback of the season and the Knicks with their biggest blown lead at 17 points. The game turned for the Bulls when first Hinrich disrupted Felton on a drive and Butler picked up the loose ball and broke out for a dunk. On the next Knicks’ possession, Butler picked off a long, lazy pass from Prigioni and had his second dunk in 13 seconds. The crowd erupted and the Knicks went into head down, one-on-one mode and missed their last eight shots of the quarter. Belinelli came back with a long two, Hinrich made a three, Butler got a switch onto Kidd and drove the aging veteran whom the Bulls were going at on every opportunity for a three-point play. The onslaught continued as Robinson closed the quarter with a three to get within 82-80 after three. The Knicks clearly seemed to be tiring as Hinrich grabbed his own miss and threw out to Hamilton for a three and 85-82 lead, the Bulls first lead since Deng hit the first shot of the game. The Knicks were shorthanded as well with the injuries, and perhaps that’s why Woodson played Kidd so much. But Kidd was a statue and Hinrich was taking every chance to go at him, coming up with a rare finger roll drive for a score and 92-88 Bulls lead with 7:51 left. Robinson then made a nice cut off the top and Butler found him for a score and added another of his five threes in a Knicks’ like 11 attempts and with 5:42 left it was the Bulls ahead 99-90. Robinson danced and mugged his way off the court in his series of celebrations. I did ask him after the game if he could provide me with a glossary of the various actions. He looked at me a little curiously and left. Hinrich twice more went at Kidd and was fouled, making four free throws for a 103-96 lead with 2:44 left. But even if the Knicks are predictable, sometimes it’s those shots going as Smith made a three to bring New York within 103-99, Felton scored after a wild Robinson three and after Butler and Robinson missed, Anthony drove and was fouled by Butler with 14.5 seconds left. Anthony made both to tie the game at 105 as he may be the game’s best pure scorer and seems likely to win the scoring title the way the Knicks constantly go to him. Deng drove, took a bump, fell and the shot didn’t. The Bulls, though, left 1.5 seconds, giving Anthony one more shot to win, which he missed from 20 feet as Hinrich ran at him and by as regulation expired. The Bulls then owned the overtime with Robinson driving for a three point play after an opening Felton miss, Deng setting up for a three on a Boozer pass after Anthony scored, coming up with a big block on Smith and then Robinson beating Iman Shumpert on a drive. Deng then pretty much settled it with 1:21 left when the Knicks relaxed, apparently thinking the Bulls were going to stall with a five-point lead. Deng drove in for the layup to not only break another long winning streak, but to go to 6-1 against the top two seeds in the Eastern Conference. Probably not, at least not that they’d admit. But you know with a winning record against every top six Eastern Conference team but the Pacers and injured players returning it would hardly be surprising if the Bulls remain a team to avoid. You never know what you’re going to get from these Bulls. Yes, watch and watch out.